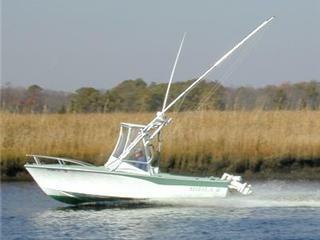 The Bowrider has been a favorite for those wishing a more "fun" boat. Want to fish? There's two cockpits from which to cast your line! And when it's time to anchor, standing in the forward cockpit handling this anchor is easy, even when there are the rolling waves. CJ was originally purchased by Carl Moesly and named by Jeanne. After a month's work of stripping out the old rigging, Moesly determined she was too much boat for cruising his river and passed her to Carla. With a solid transom & cockpit sole, minor repairs were made, lots of cosmetic work retaining as much of the original appearance & hardware as possible. With a new 115hp Etec in 2007 she'll ride along at almost 40mph with 2 people. The windshield and bow railing were left off for the more sporty look. Originally purchased new in Miami by his uncle, the 'Shiela B' was transferred to Don in 1988 when he couldn't pass on a boat that played a big part in his childhood memories. 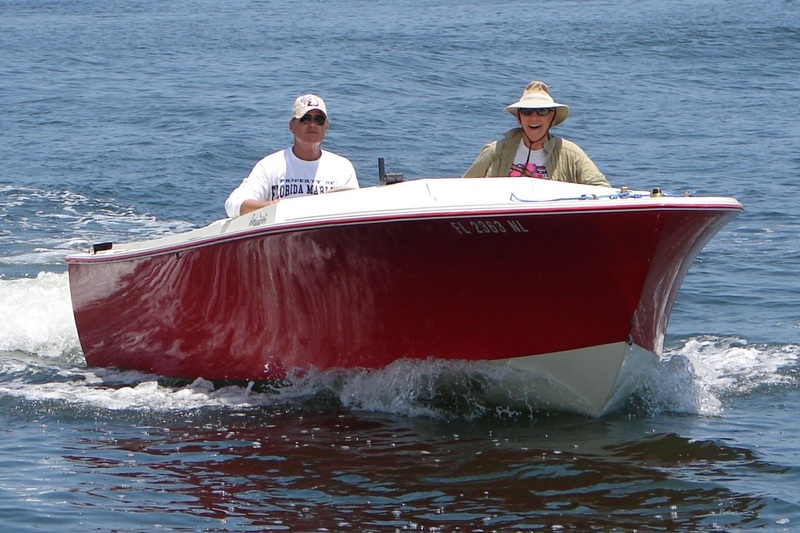 He re-worked the engine and kept her running until 2000, when he finally replaced the engine and gave her a new transom. Everything else is basically original with the exception of the custom top he added. She is enjoyed as their family fun fishing boat. 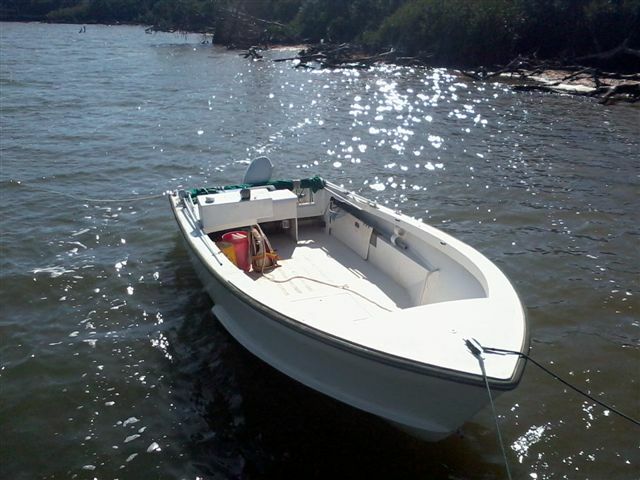 The Bowrider was found & purchased in Green Cove Springs in early 1997, boat, motor and trailer. The motor was junk and replaced by a 2000 Johnson 150 carb engine right before OMC went bankrupt, but no problems ever. The boat was a wreck but structurally sound. Steve did all the glass repair work, pulled out the gas tank and flushed it, and had an Imron paint job applied. The boat will run over 50 mph with two aboard and people have told him it is the easiest riding hull they have ever been in. It is also a great ski boat. After many months of searching, DD was found in northern Florida, seen, purchased & trailered home on the same day. She is original throughout, and has a very old 1970's Alpha I Mercruiser, which happens to run like a champ. She enjoys the lifestyle of the Florida Keys & is great for diving the shallow reefs. In March 2013, the boat was sold and moved to Canada. pressure treated 16’ - 2X12’s to rebuild our island place in Boca Grande. repowered it in 2007 with a 90 E-Tec. She will run WOT in the mid thirties with 3 divers, 7 tanks, two big coolers and all the dive gear, but I usually cruise about 20 at 3300 R PM’s because I am old and we don’t like to spill our drinks. After most 75 mile days to 36’ of water off of Bayport, I cannot put 18 gallons in the 32 gallon fuel tank. It is just a great hull that still works hard for us.